The Mahjoub Family produces one of the finest Provencal-style olive oil's available in the world market, Les Moulins Mahjoub Tunisian Extra Virgin Olive Oil. From olives handpicked in December & January, Mahjoub olive oil is produced from olives that are just turning from green to black resulting in an oil that has a soft, long finish on the palate. Mahjoub Tunsian olive oil is unfiltered, & the color is that of green apples. Les Moulins Mahjoub has been a family Tunisian business for more than a century says Majid Mahjoub, who is truly a man of Old World charm & New World high spirits! 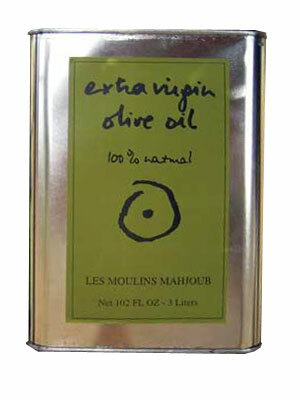 Les Moulins Mahjoub Tunisian Extra Virgin Olive Oil. Size: 3 liter (102 oz.) tin Mahjoub Tunisian Extra Virgin Olive Oil.